Commons Speaker John Bercow won a standing ovation from members of the UK Youth Parliament after launching an attack on the "evil" of the BNP. He told them the BNP was a "poison which we could well do without". Mr Bercow was speaking at the end of an historic day's sitting on which the Commons benches were occupied by non-MPs for the first time. The 300 youngsters debated university fees, youth crime, public transport, the voting age, jobs and the economy. Mr Bercow introduced the session with a speech on the importance of democracy - and praised the fact that the Youth Parliament was far more ethnically diverse and had more female members than the House of Commons. The 300 Members of the Youth Parliament (MYPs) were elected by their peers. Mr Bercow presided over a series of lively and passionate debates - and only once had to tick off the youngsters for un-Parliamentary language. MYPs are elected in annual youth elections across the UK. Anyone aged 11 to 18 is entitled to stand or vote. In the past two years, 1m young people have voted in elections. Commons leader Harriet Harman began the session by welcoming the MYPs, telling the crowded chamber: "There's only one rule - enjoy it and don't be nervous." Funmi Abari, an MYP for London, introduced the first debate - on scrapping university tuition fees in England and Wales. Opposing the move, she denied it would increase accessibility and said: "There's no such thing as a free lunch." The MYPs also debated lowering the voting age to 16 and an impassioned speech from James Evans, from the south east of England, who said: "Are we mature enough to vote at 16? We are mature enough to leave home, go out to work, pay tax. "At 16 we can marry our MP, sleep with our MP and we can have children with our MP. We can sign up in preparation to fight for and then potentially die for our MP. "And suddenly we are not mature enough to vote for them. What an absolute disgrace." To cheers, he said: "It's time for Parliament to get its priorities right. Westminster should wake up." Mr Bercow described this contribution as "as powerful a speech as I've heard in a long time". But Jemma Karmaleeta Nye, from Wales, said giving the vote to 16-year-olds was "pointless". She said: "We need education to go with it." The session ended with Mr Bercow breaking the tradition which dictates the Speaker must be impartial by launching an attack on the BNP, who are not represented in the Commons but have recently gained two MEPs in Brussels. He said during the youth debates there had been passing references to "the scourge of the BNP". And he insisted: "I'm under absolutely no obligation whatsoever to be impartial as between the forces of democracy on the one hand and the forces of evil on the other." To applause, Mr Bercow added: "I do feel very, very, very strongly as someone from a Jewish background that the evil of the BNP is that its whole politics is based upon and driven by hate. "That is a poison which we could well do without." Giving his reaction to Mr Bercow's comments, a BNP spokesman said: "We are not surprised by his anti-democratic comments against the BNP. "However, we find these comments hypocritical from a man who was once a member of the far-right Conservative Monday Club, serving as Secretary of its Immigration and Repatriation Committee." Ahead of the Youth Parliament experiment, Mr Bercow said it would show youngsters how the work of the Commons was relevant to their lives. Three young people introduced each topic, one speaking for a viewpoint and one against, with the third summing up the issue. MYPs were then given the opportunity to put forward their own opinions, speaking for up to a minute each. The debates ended with votes using the division lobbies. 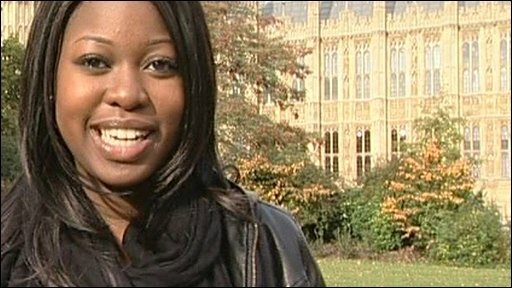 Ten young people will report on the proceedings for the BBC's journalism project for young people, School Report. Earlier this year, a small group of backbench Conservative MPs led an attempt to keep the Youth Parliament out of the chamber. However, it was allowed one-off access, following a similar event in the House of Lords in 2008.